Queen and Adam and the guys wrap up their 10-night residency at the Park Theater tonight. It was short and very sweet and hopefully may lead to other shows there in the near future. Many ALLers are fortunate to be there tonight to enjoy this moment in QAL history. Just saw a life changing concert. @QueenWillRock and @adamlambert put on what I could call the best concert I may ever see in my life. I’m not kidding when I say I cried. It was the best. Pics and videos to follow!! Did some eavesdropping tonight whilst filming. Guy next to me hadn’t moved much all night until TSMGO came on and then couldn’t get his phone out fast enough to zoom in on Adam and film him. After it ended he googled Adams name & checked out his music profile and read some stuff. Tracey ‏ @kinkykiedis 10h10 hours ago Did some eavesdropping tonight whilst filming. Guy next to me hadn't moved much all night until TSMGO came on and then couldn't get his phone out fast enough to zoom in on Adam and film him. After it ended he googled Adams name & checked out his music profile and read some stuff. I LOVED my seats tonight. 🙌🏻🙌🏻 Section 204! Everything was just incredible!! Had teens behind me squeeing their brains out!! Susie Fierce ‏ @SusieFierce 12h12 hours ago I LOVED my seats tonight. 🙌🏻🙌🏻 Section 204! Everything was just incredible!! Had teens behind me squeeing their brains out!! Hmmm… no shout out’s from the cache of industry artist’s, at last night’s concert? They are a ‘fickle clique,’ & refrain from praising greatness when it is due. Thankfully, Adam is not like that & keeps it real. I wonder who was all there? Robbie Williams was totally in awe, and brilliantly said so. Kudos for him admitting it so eloquently. twilightmagic8. They are all jealous. Performing: Justin Timberlake, Fleetwood Mac, Childish Gambino, Jack White, Carrie Underwood, Mariah Carey, Imagine Dragons, Jason Aldean, Shawn Mendes, Luke Bryan, Lynyrd Skynyrd, Panic! At The Disco, Kelly Clarkson, Kygo, Rae Sremmurd and Logic! aren’t any prizes IMO, of course. Even Justin Timberlake. I can’t stand him. Well maybe Fleetwood Mac is ok.Don’t know what Shoshanna was talking about. “everybody is here”. Why didn’t she give names? aren't any prizes IMO, of course. Even Justin Timberlake. I can't stand him. Well maybe Fleetwood Mac is ok.Don't know what Shoshanna was talking about. "everybody is here". Why didn't she give names? The shows were, as you might expect, absolutely fabulous. The staging worked wonderfully in that size venue, and we in the audience felt very connected to the guys on stage. Adam’s voice was astounding throughout, but especially on WWTLF and TSMGO he brought the audience to its knees. I mean seriously, to hear that voice in that venue singing those songs – the power, the emotion, the control, the way it just wrapped around you and held you tight – it was unbelievable. We keep saying that it’s hard to believe that Adam could possibly get any better, and then he just goes and gets better and better. Unreal. And he looked gorgeous – hair and face and costumes all perfect. His hips were well lubed and swiveled well, I’m happy to report. I LOVED being on the floor, near the end of the thrust to our left and the smaller outthrust right in front of us. WOW what a spot. I owe a huge debt of gratitude to mmm222 for getting those tickets! We also owe a huge debt of gratitude to mmm222 for arranging our dinners! On Saturday night, we had a delightful and delicious Mexican food dinner in the NY NY complex. We had a big and boisterous group: mmm222, nkd, rs, asifclueless and Mr. asifclueless, little dutchess and the duke, rainbowgal and Mrs. rainbowgal, trchrsd, ovationimpact, Reese, ladybug, Tothebeat, Mr. Tothebeat, and yours truly. What a delight it was to see everyone and catch up and visit! See luval‘s great, detailed recap of Friday’s adventures on the Sept 21 (show #9) show thread. Thanks for that great recap, luval! Gotta go board my plane! Back to real life tomorrow. Sigh. 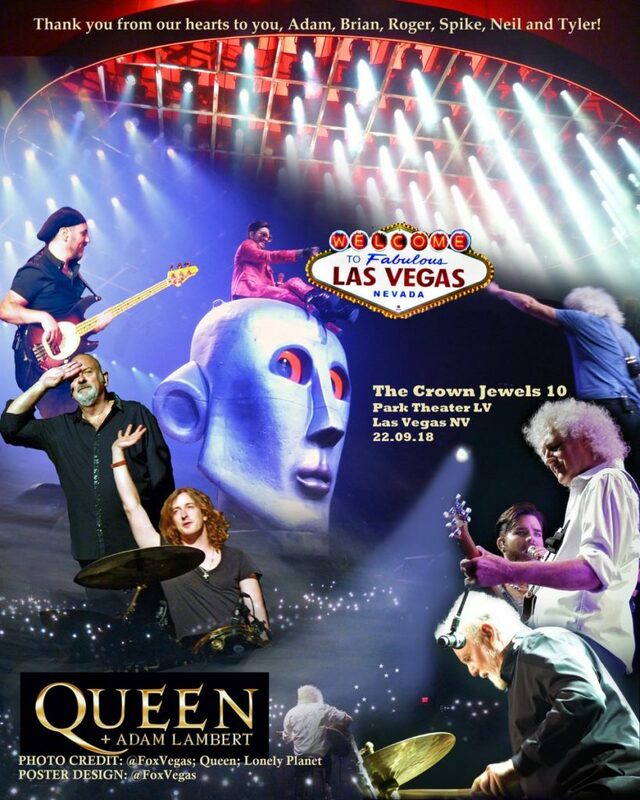 Thanks for the awesome QAL adventures in Las Vegas, all of my ALL friends!! Adam & the band shake hands with Carrot Top . I arrived home at 1 AM yesterday morning to a rainy, cool, very green Maryland in sharp contrast to Las Vegas. What a whirlwind weekend! A big thanks to cwm and luval for their recaps of the Friday and Saturday nights shows. That makes it easier for me! I’ll just add a few comments of my own. First of all the venue…the smaller, more intimate setting worked really well. The acoustics were fantastic! Really clear sound, perfectly mixed and the right volume. That was true even for our group who were on the floor right by the stage. Sometimes the sound is a little distorted when you’re that close. They did a great job adapting the set and the set list to the smaller venue and the Las Vegas crowd. The show started off with a bang with WWRY, pulled you in and proceeded at a brisk pace through the all the hits. Adam was,of course, magnificent. I hadn’t seen him up close in over a year. (We were further from the stage in London.) What a beautiful man! He was absolutely gorgeous…face, hair, clothing, and,er…, body, all stunning! He just gets better and better with age, both in appearance and in his performances. His voice was unbelievably beautiful with power, clarity and, of course, perfect pitch. The shows were very similar in quality. He was more playful and goofy Friday night when his grandparents were in the audience. Heartbreak Hotel was a real treat both nights. I love it when he sings in his bluesy voice with his lower register. Then there was the hip motion, very loose and provocative in both shows but especially prominent during HH. Check out riddle’s video of HH on Friday night. Adam was bouncing his chain off his crotch during during the instrumental part. It was too funny! We really had a great time catching up with many of our fellow ALLers. We missed those of you who couldn’t make it. If QAL comes back for another residency, do everything in your power to get there. You’ll love every minute of it! I arrived home at 1 AM yesterday morning to a rainy, cool, very green Maryland in sharp contrast to Las Vegas. What a whirlwind weekend! A big thanks to cwm and luval for their recaps of the Friday and Saturday nights shows. That makes it easier for me! I'll just add a few comments of my own. First of all the venue...the smaller, more intimate setting worked really well. The acoustics were fantastic! Really clear sound, perfectly mixed and the right volume. That was true even for our group who were on the floor right by the stage. Sometimes the sound is a little distorted when you're that close. They did a great job adapting the set and the set list to the smaller venue and the Las Vegas crowd. The show started off with a bang with WWRY, pulled you in and proceeded at a brisk pace through the all the hits. Adam was,of course, magnificent. I hadn't seen him up close in over a year. (We were further from the stage in London.) What a beautiful man! He was absolutely gorgeous...face, hair, clothing, and,er..., body, all stunning! He just gets better and better with age, both in appearance and in his performances. His voice was unbelievably beautiful with power, clarity and, of course, perfect pitch. The shows were very similar in quality. He was more playful and goofy Friday night when his grandparents were in the audience. Heartbreak Hotel was a real treat both nights. I love it when he sings in his bluesy voice with his lower register. Then there was the hip motion, very loose and provocative in both shows but especially prominent during HH. Check out riddle's video of HH on Friday night. Adam was bouncing his chain off his crotch during during the instrumental part. It was too funny! We really had a great time catching up with many of our fellow ALLers. We missed those of you who couldn't make it. If QAL comes back for another residency, do everything in your power to get there. You'll love every minute of it! Some great photos from @ma.ch.mo from 3 different nights. She even got a good one of Neil and Tyler. and Adam too, of course! Home now, but after the show, my husband and I traveled up through Salt Lake City and on to Yellowstone Park, where internet coverage was often spotty, so my recap of the last show for QAL is, as usual, late! But I’m gonna do it anyway, because It was such a wonderful experience. I can’t top the great stories already posted by mmm222 and cwm; they really captured the total experience: the magnificence of Adam’s voice coupled with the perfection of his famous “bandmates”, the seamless production, the outstanding crew – my husband never felt the need to wear the earplugs he insisted we bring along because the the sound was so impeccably mixed and balanced throughout the show. But I’d like to put in my own huge “thank you” to all the people they listed in their recaps who were at the “last supper” on the 22nd of Sept., with special kudos to mmm222, who was acting as dinner organizer, ticket facilitator, and a bewildering array of other duties, helping so many of us enjoy every minute of not only the concert but the time before and after. What was new to me, though very familiar to many of the ALLers who go to see Adam, was that wonderful experience where someone you’ve never met before raves about the show. We were getting our room keys rejiggered (carrying them too close to our phones made them inoperable, and yes, luval, it was an awkward process), when I noticed a QAL shirt on a woman by the desk. So, of course, I asked her about it. She had to stop raving to the desk clerk about how wonderful the show was, especially Adam’s voice, and how it was the best concert she’d ever seen – to talk to me, lol. She looked very serious when she said she’d never, ever bought a concert t-shirt before, that’s how impressed she was. Her husband was more circumspect. He said they had been to hundreds of concerts and allowed there were three he would judge to be the best. QAL was one of those. He also looked up at my husband and said, be prepared to stand for the whole show, as everyone was on their feet in their area from the beginning. It was also great to listen to the girl with the purple hair in the elevator, who talked nonstop about the show, and just before she got off, whipped out a Roger Taylor signed drumstick she nabbed at the end of the concert. t was a bonus to see trchrsd, who was added by mmm222 later to the list of people expected to be at the dinner. I did really miss the chance to meet our luval, if only to thank her for all the links and info she brings to ALL. I had to laugh when I read her recap: totally honest descriptions of the casinos’ smoke problem, and the check-in procedures at the Park. Wonder if they’re really saving money on the self-serve kiosks…it took two “helpers” to run down our reservation because they put it under the wrong name. I have to say i did miss jlurks, though. My husband did too; he remembers having a great time talking to him at the last SAP dinner get together. GREAT recaps, mmm222 and Tothebeat!! Thank you! !